Background and objectives The significance of persistent hematuria or proteinuria in patients with ANCA-associated vasculitis who are otherwise in clinical remission is unclear. Design, setting, participants, & measurements A post hoc analysis was conducted using participants enrolled in two randomized, placebo-controlled clinical trials who had active GN due to ANCA-associated vasculitis, had positive ANCA, and achieved remission by month 6. Dipstick and microscopic urinalyses were performed at each visit. Persistent hematuria or proteinuria for at least 6 months and the cumulative duration of hematuria were examined. Renal relapse was defined as new or worsening red blood cell casts and/or worsening kidney function according to the Birmingham Vasculitis Activity Score for Granulomatosis with Polyangiitis. Results There were 149 patients included in this study: 42% had persistent hematuria, and 43% had persistent proteinuria beyond 6 months. Persistent hematuria was associated with a significantly higher risk of relapse, even after adjusting for potential confounders (subdistribution hazard ratio, 3.99; 95% confidence interval, 1.20 to 13.25; P=0.02); persistent proteinuria was not associated with renal relapse (subdistribution hazard ratio, 1.44; 95% confidence interval, 0.47 to 4.42; P=0.53). Furthermore, greater cumulative duration of hematuria was significantly associated with a higher risk of renal relapse (adjusted subdistribution hazard ratio, 1.08 per each month; 95% confidence interval, 1.03 to 1.12; P<0.01). The median time to renal relapse was 22 months. Conclusions In patients with ANCA-associated vasculitis and kidney involvement who achieve remission after induction therapy, the presence of persistent hematuria, but not proteinuria, is a significant predictor of future renal relapse. GN is a severe manifestation of ANCA-associated vasculitis (AAV), and it is associated with ESRD and death (1,2). Controversies exist regarding the clinical significance of persistent microscopic hematuria in patients with AAV who are otherwise in remission after treatment with standard induction therapy. Some experts regard persistent hematuria as a marker of ongoing disease activity, whereas others have found that many cases of stable hematuria can be explained by prior kidney damage (3,4). Prior studies evaluated the utility of urinalysis in AAV using retrospective data from single-center cohorts and found conflicting results (4–7). These descriptive studies were all case series and limited by small numbers of patients. To further evaluate the utility of urinalysis in AAV, we investigated the association between persistent hematuria and proteinuria after completion of induction therapy with outcomes among patients enrolled in the Rituximab in ANCA-Associated Vasculitis (RAVE) Trial and the Wegener’s Granulomatosis Etanercept Trial (WGET) (8,9). We analyzed individual participant data from patients enrolled in two clinical trials: the RAVE Trial and the WGET. Details of these trials have been previously published (8–10). Briefly, both trials were multicenter, randomized, double-blind, placebo-controlled trials that enrolled patients with AAV who had a Birmingham Vasculitis Activity Score for Granulomatosis with Polyangiitis (BVAS/GPA; originally named the Birmingham Vasculitis Activity Score for Wegener Granulomatosis ) of at least three. BVAS/GPA was used in both trials as an activity index for AAV and includes three disease items for kidney involvement: (1) hematuria (≥1+ by urine dipstick or ten or more red blood cells [RBCs] per high-power field), (2) RBC casts (major item), and (3) rise in creatinine >30% or fall in creatinine clearance >25% (major item) (11). The frequency of study visits was similar between the two studies. All patients received standardized induction therapy including glucocorticoids at enrollment (Supplemental Table 1). Patients from the two trials were eligible for this study if they met the following criteria: (1) met a diagnosis of granulomatosis with polyangiitis or microscopic polyangiitis according to the 1994 Chapel Hill Consensus Conference definitions (12) or the American College of Rheumatology classification criteria for granulomatosis with polyangiitis (13), (2) at least one kidney BVAS/GPA item during enrollment, and (3) positive proteinase 3 (PR3)-ANCA or myeloperoxidase (MPO)-ANCA by ELISA. To remove patients with refractory disease, patients were excluded if they did not achieve remission by month 6 from the enrollment date or did not have a sustained remission lasting 6 months. Patients on chronic dialysis at enrollment were also excluded. Patients were censored after they developed a relapse, developed ESRD, withdrew from the study, or reached the common closing date for the study in which they were participating. To determine if worsening hematuria (defined by the number of RBCs per high-power field using light microscopy) predicted renal relapse, an analysis was performed only evaluating data from the RAVE Trial, because quantification of hematuria was available in this trial but not in the WGET. Urine dipstick and microscopic analyses of urine sediment were performed by clinical laboratories at every visit. The main variable of interest was persistent hematuria beyond the first 6 months after enrollment, which was solely on the basis of urinalysis data. Patients were considered to have persistent hematuria until the occurrence of two consecutive visits without hematuria. Additional exposures of interest included persistent proteinuria for first 6 months, cumulative duration of hematuria, and cumulative duration of proteinuria (the latter two variables were analyzed as time-varying covariates). To examine the relationship between worsening levels of hematuria and renal relapse, we evaluated only the patients in the RAVE Trial, in which hematuria was recorded as an ordinal variable on the basis of the number of RBCs per high-power field seen on microscopic urinalysis: 0, 1–5, 6–15, 16–50, or too numerous to count. Further details regarding this subgroup analysis are available in Supplemental Material. The primary outcome was renal relapse defined as new or worsening RBC casts and/or rise in serum creatinine considered by the investigator to be related to vasculitis according to the BVAS/GPA. New or worsening hematuria on the BVAS/GPA was not included in the outcome for this study, because hematuria is also the main variable of interest; therefore, the inclusion of hematuria in both the exposure and outcome could overestimate the association between hematuria and renal relapse. Secondary outcomes included any relapse (defined as BVAS/GPA>0, not including a hematuria item), development of ESRD recorded on the Vasculitis Damage Index, and slope of the change in eGFR as determined by the Modification of Diet in Renal Disease equation (14). For the analysis of the relationship between degree of hematuria and outcome, the outcome was renal relapse. Two-sample comparisons were performed using Wilcoxon rank sum tests for continuous variables and chi-squared tests for categorical variables. Adjusted analyses were performed using competing risk regression for the outcomes of renal relapse and any relapse, treating occurrence of nonrenal relapse and ESRD as competing events for the outcome of renal relapse and ESRD as a competing event for the outcome of any relapse. A nonrenal relapse was considered a competing event, because a patient’s risk for a subsequent renal relapse would be altered by changes in therapy and monitoring. Cox proportional hazards regression was used for the outcome of ESRD, and a generalized linear model assessed slope of change in eGFR. The association between risk factors and outcome was expressed as subdistribution hazard ratio (sHR) or hazard ratio (HR) with 95% confidence intervals (95% CIs). In the models assessing the relationship between persistent hematuria or proteinuria and outcome, we a priori adjusted for study (the RAVE Trial or the WGET), ANCA type (anti-PR3 or anti-MPO), baseline serum creatinine, and baseline pulmonary involvement (as noted on the BVAS/GPA), because these factors have been associated with an increased risk of renal relapse in prior studies (15–17). Handling of missing urinalysis data is described in Supplemental Material. Additional analyses included evaluation for effect modification by ANCA type and a hematuria by proteinuria interaction to assess if the presence of both persistent hematuria and proteinuria increased the risk of relapse compared with either alone. We performed sensitivity analyses adjusting for immunosuppressive therapies, adjusting for an increase in ANCA level in the preceding 6 months as previously defined (10), and excluding premenopausal women (Supplemental Material). A significance level of 0.05 was used for all tests of hypothesis. All analyses were performed using Stata, version 12.1 (StataCorp, College Station, TX). Among the 377 participants enrolled in the RAVE Trial and the WGET, 149 were eligible for this study (99 from the RAVE Trial and 50 from the WGET) (Supplemental Figure 1). Baseline characteristics are shown in Table 1. All patients had active kidney involvement and hematuria at trial enrollment, and 37 (37%) of the patients in the RAVE Trial had kidney biopsy confirmation at enrollment (details on kidney biopsy data from the WGET were not available). Among these 37 patients, at baseline, 100% had new or worsening hematuria, 78% had a rise in serum creatinine, and 65% had RBC casts. Persistent hematuria beyond 6 months from enrollment occurred in 42% of patients. Similar rates of persistent hematuria were seen between patients with and without kidney biopsy confirmation at enrollment in the RAVE Trial (59% versus 45%; P=0.17). Overall, the median (interquartile range [IQR]) duration of hematuria was 6 (3–12) months from enrollment, and after in remission, the median duration of hematuria was 3 (3–10) months. In the group with persistent hematuria for 6 months, median duration of hematuria was 17 versus 3 months in the group without persistent hematuria. Among the 149 patients, 57 (38%) developed a subsequent relapse: 18 with a renal relapse and 39 with a nonrenal relapse. A description of renal relapses is available in Supplemental Material. Eight patients developed ESRD before experiencing a relapse. Although there was no significant difference in the occurrence of any relapse between patients with and without persistent hematuria, patients with persistent hematuria had significantly more renal relapses (22% versus 5%; P<0.01) (Table 2). Among those who experienced a relapse during follow-up, median (IQR) time to renal relapse was 22 (15–36) months, and median (IQR) time to any relapse was 14 (11–24) months. There was no significant difference in time to renal relapse or time to any relapse between patients with and without persistent hematuria. Among the four patients without persistent hematuria who had a renal relapse, two developed hematuria several months before onset of relapse, whereas two were noted to have onset of hematuria on the date of relapse. Persistent hematuria beyond 6 months from enrollment was associated with a significantly higher risk of renal relapse (adjusted sHR, 3.99; 95% CI, 1.20 to 13.25; P=0.02) (Figure 1A). Adjusting for persistent proteinuria did not significantly change results. There was no difference in time to any relapse (adjusted sHR, 1.01; 95% CI, 0.55 to 1.83; P=0.99), ESRD (adjusted HR, 2.20; 95% CI, 0.52 to 9.27; P=0.28), or slope of change in eGFR (P=0.98). We did not find any significant effect modification by ANCA type (P=0.45 for interaction) or persistent proteinuria (P=0.39 for interaction). Results were similar after adjusting for induction therapy, average daily dose of prednisone, or average dose of other immunosuppressive therapy. Although there was a higher proportion of premenopausal women in the group with persistent hematuria, exclusion of the 23 premenopausal women did not significantly change results (adjusted sHR for renal relapse, 4.31; 95% CI, 1.36 to 13.68; P=0.01). Among the 60 patients in the RAVE Trial with available data on PR3-ANCA levels during follow-up, ten developed a renal relapse. Persistent hematuria remained a significant predictor of renal relapse, even after adjusting for an increase in PR3-ANCA (adjusted sHR, 6.20; 95% CI, 1.21 to 31.77; P=0.03). Persistent hematuria but not persistent proteinuria predicts a higher risk of renal relapse. Cumulative incidence curves for renal relapse in patients with and without (A) persistent hematuria for 6 months, and (B) persistent proteinuria for 6 months. Adjusted for study: ANCA type (antiproteinase 3 versus antimyeloperoxidase), pulmonary involvement, and baseline creatinine. Relapse without renal involvement and development of ESRD were competing events. Similarly, greater cumulative duration of hematuria was significantly associated with a higher risk of renal relapse (adjusted sHR, 1.08 per each month; 95% CI, 1.03 to 1.12; P<0.01), such that each additional month of hematuria increased the rate of renal relapse by 8%. Cumulative duration of hematuria was not associated with any relapse (adjusted sHR, 1.03; 95% CI, 0.99 to 1.06; P=0.13) or ESRD (adjusted HR, 1.00; 95% CI, 0.92 to 1.09; P=0.99). Adjusting for cumulative duration of proteinuria did not significantly change results (Table 3). Among the 147 patients included in the analysis of proteinuria, 63 (43%) had persistent proteinuria beyond 6 months after enrollment. Compared with patients without persistent proteinuria, patients with persistent proteinuria had a similar number of renal relapses (ten [15%] versus eight [10%]; P=0.25) but a significantly lower number of nonrenal relapses (nine [14%] versus 30 [36%]; P<0.01) and significantly more occurrences of ESRD (seven [11%] versus one [1%]; P<0.01). Persistent proteinuria beyond 6 months after enrollment was not significantly associated with renal relapse (Figure 1B), any relapse, ESRD, or slope of change in eGFR (Supplemental Table 2). The cumulative duration of proteinuria was associated with renal relapse (adjusted sHR, 1.06 per additional month of proteinuria; 95% CI, 1.02 to 1.10; P<0.01), but this relationship was no longer significant after adjusting for cumulative duration of hematuria (Table 3). 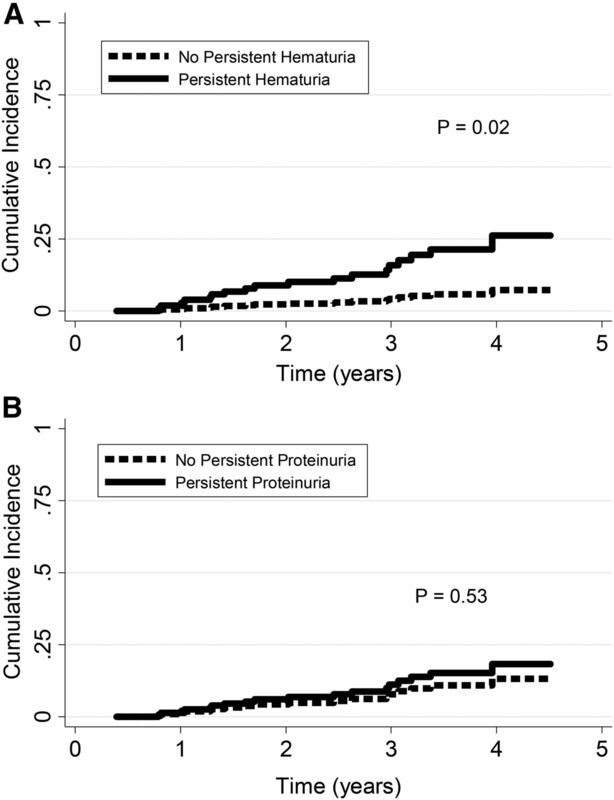 Cumulative proteinuria was not an effect modifier for cumulative hematuria (P for interaction =0.11), and therefore, having both persistent hematuria and proteinuria did not increase the risk of renal relapse compared with hematuria alone. Cumulative duration of proteinuria was not associated with ESRD (adjusted HR, 1.05; 95% CI, 0.98 to 1.12; P=0.16). Within the RAVE Trial cohort, an increase in hematuria level was significantly associated with a higher risk of renal relapse within the next 6 and 12 months (Table 4). Worsening levels of proteinuria were not associated with renal relapse. This study shows that, among patients with AAV and active kidney involvement who achieve remission within 6 months, persistent hematuria, but not proteinuria, is associated with a significantly higher risk of subsequent renal relapse. Persistent hematuria or proteinuria is not associated with any relapse, ESRD, or decline in kidney function over time. This is the largest study to examine persistent hematuria and proteinuria in patients with AAV who are otherwise in clinical remission and the only study to leverage a clinical trial cohort to study this question. This is also the first study to show that persistent hematuria is a risk factor for renal relapse independent of previously studied predictors of relapse, including an increase in ANCA level. It remains unclear whether persistent hematuria is indicative of indolent disease activity or rather, a prognostic marker of a subgroup of patients with resistant disease who are at risk for relapse. This distinction is important, because ongoing disease activity would necessitate prolonged or more intense courses of induction therapy, perhaps including glucocorticoids, whereas the latter might influence the duration of maintenance therapy. Two smaller studies examined the clinical significance of persistent hematuria in AAV and concluded that persistent hematuria was not associated with disease activity (4,6). Similar to the report by Magrey et al. (4), patients in our cohort with persistent hematuria had a prolonged time to renal relapse (median =22 months). The extended time to relapse is counter to the idea that persistent hematuria identifies active disease, unless smoldering disease can persist for almost 2 years in the absence of a decline in kidney function or the appearance of other disease manifestations. Furthermore, persistent hematuria was not associated with a decline in kidney function or risk of developing ESRD, similar to findings in a prior study (7), suggesting that hematuria is also not simply a marker of greater kidney damage. We also addressed the question of whether worsening hematuria (i.e., increasing levels of hematuria) is associated with renal relapse and found that increases in hematuria significantly predicted the development of a renal relapse in the subsequent 6 and 12 months. Although we expected increases in hematuria to occur at the onset of a renal relapse, it was interesting to find that worsening hematuria preceded the development of a physician-determined relapse by many months. To our knowledge, this is the only study to examine levels of hematuria and relapse in AAV. These results support the routine use of urinalysis in clinical practice and emphasize the importance of close clinical monitoring in patients with worsening hematuria, because this may be an early indicator of relapse. In contrast to hematuria, proteinuria was neither an independent predictor of renal relapse in multivariate analyses, particularly after adjustment for baseline serum creatinine, nor a significant effect modifier of hematuria. Having both hematuria and proteinuria did not increase the risk of relapse more than hematuria or proteinuria alone, although this study may have been underpowered to examine this interaction. The lack of an association between proteinuria and relapse is consistent with our current understanding of proteinuria as a marker of damage in AAV rather than active GN (3). Although our results found no association between worsening levels of proteinuria and renal relapse, future studies are needed in which proteinuria is more accurately quantified. Strengths of this study include the advantages of using clinical trial data that contain protocolized visits and assessments made by experts in the management of AAV. Furthermore, although drug therapy was also standardized, we accounted for prednisone and other immunosuppressive therapies at each visit in a sensitivity analysis and found that results did not change. In the BVAS/GPA, the significance of hematuria and whether it is a marker of active vasculitis or damage are subject to interpretation by the individual investigator; therefore, we did not include hematuria in the definition of relapse to avoid bias (i.e., relapses defined only by new/worsening hematuria on the BVAS/GPA would not be considered relapses in this study). Therefore, our results likely underestimate the true association between hematuria and renal relapse, because patients who were considered to have worsening hematuria alone would receive additional immunosuppression, thereby reducing their risk of going on to develop more severe manifestations of kidney disease (e.g., RBC casts or elevated serum creatinine). There are also limitations of this study to consider. We were limited to dipstick and microscopic urinalysis data analyzed in a clinical laboratory, and examination of urinary sediment by a nephrologist or another appropriately skilled physician was not routinely performed. Urinalysis was performed approximately every 3–6 months, and results at each visit were assumed to represent the entire interval between visits. It is possible that fluctuations in urine findings occurred weekly or even daily, leading to a misclassification bias; however, this bias would most likely be nondifferential and thus, would not significantly affect results. There was also a relatively low number of renal relapse events that have the potential to affect accuracy of the results. It is also important to note the subjectivity of the BVAS/GPA and its reliance on the clinician’s judgment (e.g., whether worsening hematuria is due to vasculitis or not); however, the Birmingham Vasculitis Activity Score system is the standard disease activity measure used in clinical trials of AAV. In this study, similar to routine clinical practice, determination of renal relapse was not confirmed by kidney biopsy, which could more accurately distinguish active disease from damage. Although RBC casts are accurate markers of GN (18), a rise in serum creatinine may be due to other causes in the absence of active disease (e.g., progression of CKD). However, there was only one patient whose renal relapse was defined by a rise in serum creatinine alone, and this patient also had extrarenal manifestations of vasculitis, including scleritis and bloody nasal discharge. Further studies are needed to determine whether persistent hematuria is a marker of active GN (versus a prognostic marker of future relapse) and whether changes in therapeutic management (e.g., prolonging the duration of maintenance therapy) of patients with persistent hematuria improves outcomes. Although persistent hematuria is associated with an increased risk of renal relapse, only 22% of patients with persistent hematuria went on to develop a renal relapse in this study; therefore, the majority of patients with persistent hematuria did not develop a renal relapse. However, given the severity of kidney disease in AAV, this a substantial clinically important risk, and this study showed that persistent hematuria was a better predictor of renal relapse than ANCA type (PR3 versus MPO). Although this study cannot determine if patients with persistent hematuria require prolonged therapy, results from this study emphasize the importance of regular monitoring of urinalysis in patients with AAV and prior kidney involvement. The presence of persistent hematuria should increase clinicians’ concern about the potential for renal relapse and could possibly lead to more frequent clinical and laboratory monitoring. Urinalysis alone should not prompt retreatment or escalation of treatment in the absence of other evidence of disease activity, which may include the necessity for kidney biopsy. In summary, we found a significant association between persistent hematuria in patients who are otherwise in clinical remission after completion of induction therapy and long-term renal relapse. An increase in the level of hematuria was associated with the risk of short-term renal relapse (within 6 months). Therefore, persistent microscopic hematuria is an important component in the overall relapse risk assessment in patients with AAV. The findings of this study highlight the value of the urinalysis, an inexpensive, noninvasive, and likely underappreciated biomarker for assessment of disease course in AAV. Although the discovery of better biomarkers needs to be pursued, greater understanding of existing urinary biomarkers may help refine the use of immunosuppressive therapies, predict relapse, and improve outcomes for patients with AAV. We thank Joshua Baker for his input on data analysis. R.L.R. receives support from the Rheumatology Research Foundation and the Vasculitis Foundation. The Wegener’s Granulomatosis Etanercept Trial was supported by National Institutes of Health (NIH), National Institute of Arthritis and Musculoskeletal and Skin Diseases (NIAMS) grant N01-AR-92240; National Center for Research Resources, General Clinical Research Center grants M01-RRO-00533 (to Boston University), M01-RRO-0042 (to the University of Michigan), M01-RR-30 (to Duke University), and M01-RRO-2719 (to Johns Hopkins University School of Medicine); and Food and Drug Administration, Office of Orphan Products grant FD-R-001652. The work of E.W.S.C., J.H.S., and P.A. Merkel was supported by NIH, NIAMS grants K24-AR-02126-04, K24-AR-049185-01, and K24-AR-2224-01A1. The Rituximab in ANCA-Associated Vasculitis (RAVE) Trial was performed as a project of the Immune Tolerance Network (NIH contract N01-AI-15416; protocol number ITN021AI), an international clinical research consortium headquartered at the University of California, San Francisco. The RAVE Trial was supported by the National Institute of Allergy and Infectious Diseases, the Juvenile Diabetes Research Foundation, Genentech, and Biogen Idec. At the Mayo Clinic, the RAVE Trial was supported by Clinical and Translational Science Award (CTSA) grant UL1 RR024150-01 from the National Center for Research Resources (NCRR). At Johns Hopkins University, the RAVE Trial was supported by CTSA grant UL1 RR025005 from the NCRR and grants K23 AR052820 (to P.S.) and K24 AR049185 (to J.H.S.) from the NIAMS. At Boston University, the RAVE Trial was supported by an Arthritis Foundation Investigator award (to P.A. Monach), CTSA grant UL1 RR025771 (to P.A. Merkel) and NIH grant M01 RR00533 (to P.A. Merkel) from the NCRR, and grant K24 AR02224 from the NIAMS (to P.A. Merkel). See related editorial, “Persistent Hematuria in ANCA Vasculitis: Ominous or Innocuous?,” on pages 201–202. This article contains supplemental material online at http://cjasn.asnjournals.org/lookup/suppl/doi:10.2215/CJN.04160417/-/DCSupplemental. Persistent Hematuria in ANCA Vasculitis: Ominous or Innocuous?